The Image Share program moves beyond RSNA. 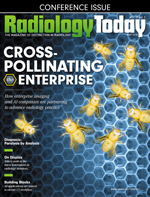 When the RSNA Image Share program was conceived, its creators viewed it as a way to demonstrate that standards-based interoperability among medical image repositories was possible and desirable—and eliminate the need for CDs in the process. Initially begun in 2011 as a joint project with the National Institute of Biomedical Imaging and Bioengineering, Image Share grew to incorporate nine vendors and several dozen hospitals and health care providers. The idea behind the Image Share program was to allow providers to share medical images through standards-based, nonproprietary interfaces, regardless of which vendor they contract with for image management. Prior to RSNA 2016, the program validated nine vendors as having met its standards for interoperability and security: Acuo (now Hyland), Agfa Healthcare, Ambra, Dicom Systems, GE, lifeIMAGE, Mach7 Technologies, Novarad, and Siemens Healthineers. Despite its success, however, Image Share was always meant to be a pilot program, and it ended its run in March. Although the RSNA Image Share program has officially ended, the program is moving to a new phase. lifeIMAGE, the architect of the program's data sharing infrastructure, is expanding the effort as Clinical Connector. Clinical Connector builds on Image Share's cloud-based clearinghouse concept to connect hospitals and health care providers with patients. Matthew Michela, the CEO of lifeIMAGE, says the expansion has been in the works for a while, and he believes Clinical Connector will accelerate the utilization of participants. "The Image Share program demonstrated the clinical value in sharing," Michela says. "We want to make sure that we continue in the spirit of providing a vendor-neutral, standards-based capability to exchange images for hospitals, for patients, and for anybody in the industry who wants to participate." Michela says Clinical Connector is 100% standards based and meets all US and international interoperability standards. It is based on Cross-enterprise Document Sharing standards, which allows more than just images to be shared; it covers all health care-centric data types such as Fast Healthcare Interoperability Resources and Health Level 7. Michela says lifeIMAGE is scaling up the program, and the company is almost done converting its own customers to the new platform. It is also offering Clinical Connector to companies that participated in the Image Share project. Additionally, any company that is willing to be validated on industry-based connection and security standards can join. Michela says the network is built in a way that allows companies to connect to it without creating proprietary interfaces. "This is a part of, in some regards, our overriding strategy," Michela says. "What we hope the industry embraces under this umbrella of democratizing data is breaking down the silos and the noninteroperable ways that health care IT companies have built their software or hardware and promulgating interoperability." Michela believes standards-based interoperability will benefit patients by allowing them to own and control their health information with easier, faster, and more secure data access. He says patients are often burdened by the challenges of managing their data when they switch from a health care provider that uses one image management vendor to a provider that uses a different vendor. "If you really care about allowing patients to have their own information in a powerful way, for their own uses, because you understand that it improves quality in health care and is the way this entire industry is moving, then you would do it in a standards-based way," Michela says. "And Clinical Connector is really more of a clarion call for the industry to say that we've done the heavy lifting; they don't have to reproduce it. We just encourage them to join us in this endeavor to increase interoperability and allow patients to participate in the benefits of data sharing in a way that reduces the barriers and the frictions that they often encounter in collecting information—which is theirs and they have every entitled right to." Although Clinical Connector allows patients from participating providers to aggregate their data into personal health records, the program is focused on business-to-business applications. But providers need to concern themselves with what patients want, Michela says. Data sharing is still in the early stages, but he expects interoperable interfaces to become the norm. "We will see, over time, as everybody in the industry matures, we will start to actually be able to share data in a more agnostic way," Michela says. "A lot of these applications are going to start to blend together because there really will be no need for consumers, hospitals, doctors, and drug companies to access the data in different ways. Those connections will exist, and the data will be transparent and mobile. But that's something the industry has to mature into."